Members of the Palatine Sikh community attended a special service at the Palatine Gurdwara for the victims of the Wisconsin shooting and the whole Sikh community. Photo by William Camargo. As hundreds flooded into the Palatine Sikh Gurdwara, or temple, Monday night, all being required to remove their shoes and cover their heads, those of other faiths were identifiable by one thing: the educational pamphlets they had picked up on their way in. 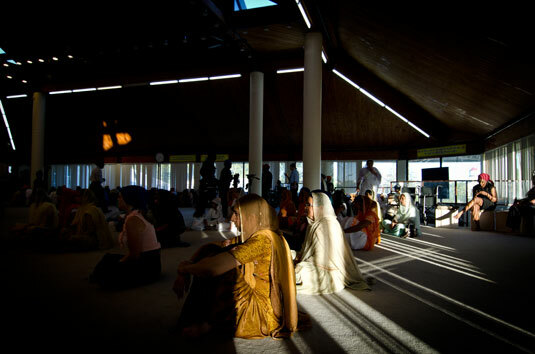 Interfaith religious tolerance was a message returned to again and again Monday night, as speakers offered their prayers for the six victims in the Sunday Wisconsin Sikh temple shooting. The candlelight vigil, held by the Sikh Religious Society, 1280 W. Winnetka St., welcomed people of all faiths to share in the sorrow and learn about Sikh culture and customs. The Palatine Gurdwara was filled with hundreds of members of the community including those from other religions. Comments were made my many community leaders. Photo by William Camargo. Republican U.S. Rep. Joe Walsh offered his condolences and called for an increase in homeland security. Photo by Lucio Villa. Jasleen Sangha resident of Grayslake takes a photo of the candlelight vigil in Paletine. "I came to support my members of the community," said Sangha. Photo by Lucio Villa. Ribbons were worn at the Sikh temple in Palatine to show respect to the victims of the Wisconsin shooting. Photo by Lucio Villa. An attendee lights a candle at the vigil. Photo by William Camargo. Candles were given to those in attendance as the vigil started outside of the temple. Members of various other religious communities were in attendance to support the victims of the recent shooting at the Sikh temple in Milwaukee. Photo by William Camargo. Attendees light up several candles during a vigil that was held Monday night at the Palatine temple. Photo by William Camargo. Candles are left on the ground at the candlelight vigil in Paletine as local Sikhs and interfaith attendees head back into the temple for a meal. Photo by Lucio Villa.